If you are the owner of a local business or corporate organisation, why not consider a partnership with Pendleside Hospice? There is no better way of enhancing your profile and building a successful relationship with us could be the key to increasing your market share and generating real business growth. It can also help you achieve your objectives in Corporate Social Responsibility. The mutual benefits of working collaboratively with the Hospice are wide and various. The donation is a result of the Affinity accounts at the Marsden which enables savers to support their chosen charity based on the idea that the more you save, the more they donate. Over the past six years, with the support of their members, the Society has donated over £74,500 which has been used to help run our local hospice. 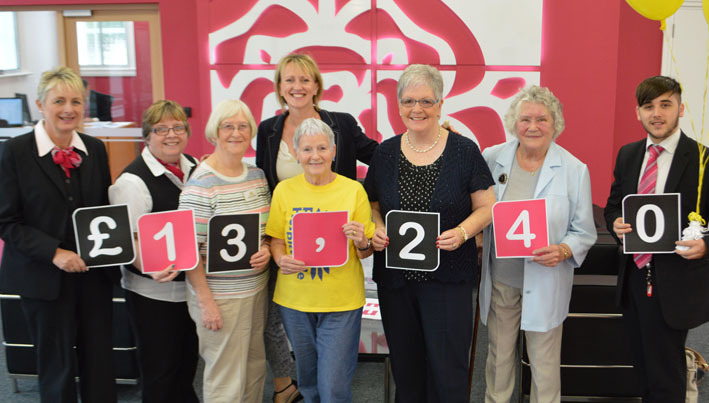 Members of the Marsden choose the affinity account as the Society’s promise is to donate 0.5% of the total average balance of all their affinity accounts to the Hospice annually. Marsden Building Society also invited Hospice volunteers; Marjorie Catlow, Colne Charity Shop Volunteer Manage, Hilda Andrews, Fundraising Volunteer, Mary Hardacre - Colne Charity Shop Volunteer Manager and Jean Jones, Volunteer Receptionist (also worked at Marsden Building Society for 38 years!) to help present the cheque. PHOTO: The staff from Smith Sutcliffe Solicitors stay up late into the night to give away bananas at Pendleside's Midnight Walk. nominate the Hospice as your Charity of the Year. match your employees fundraising efforts with pound for pound sponsorship. talks and DVD presentations to your staff available – let us help you to appreciate the full range of palliative care being provided by the Hospice. have the benefits and mysteries of the Give As You Earn (GAYE) scheme explained. recycle your printer cartridges – Tom's Stationers will collect them from you as well! promote your company at Christmas – have your company logo on your personalised Hospice Christmas Cards or take part in our successful 'Share a Christmas Card' scheme. Please contact Pendleside Fundraiser Managers, Christina Cope & Kaye Bartle to discuss your corporate fundraising ideas. Thank you to all the local companies & organisations who support Pendleside Hospice. 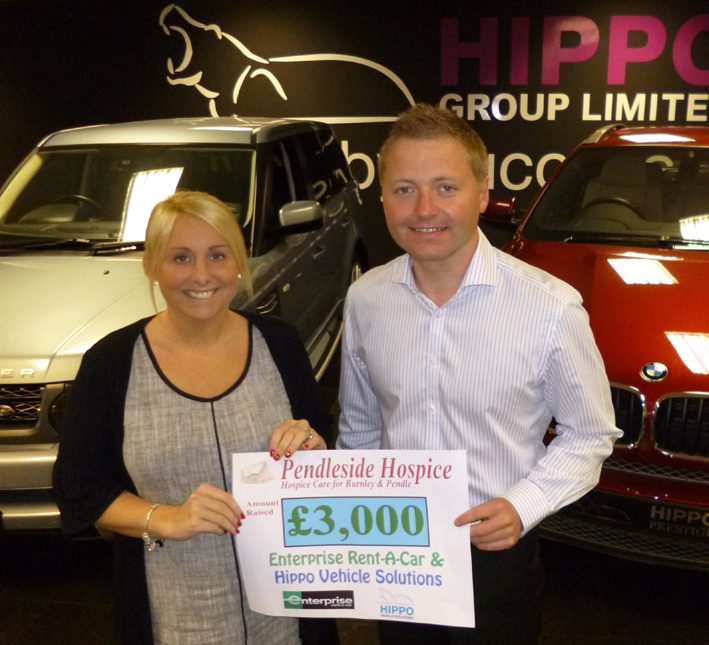 Staff at Boohoo on Heasandford Industrial Estate in Burnley raised an amazing £1,000 for Pendleside Hospice. 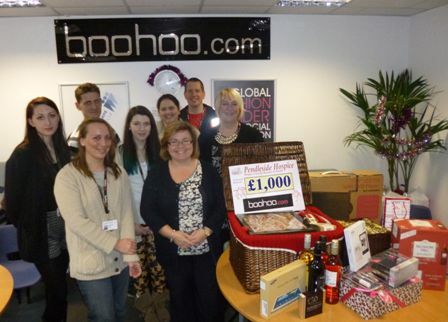 The money was raised through an in house raffle with Boohoo’s partners and suppliers donating many fabulous raffle prizes. Boohoo.com are one of the UK’s most successful online fashion retailers. Founded in 2006, they now ship worldwide from their headquarters in Manchester and Burnley.